In this section, Turck Tarantula Tying Steps, Skip takes you step-by-step through the construction of this challenging pattern. Hook: Heavy wire (or standard or light), 3X (or 2X) long, sizes 12 to 4. Body: Hare's mask (or tan-brown synthetic dubbing). 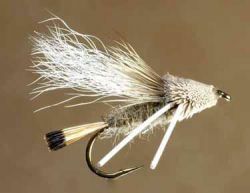 Wing: White calf tail with one strand (or more) of pearl Krystal Flash on each side. Legs: White or brown medium-diameter round rubber-strand. Head: Natural tan-brown deer hair. 4. If you want the legs out more to the sides, bind them on about two-thirds up the body, short of the wing-head area. there is no way to replace the legs if you cut them off. 1. Start the thread. 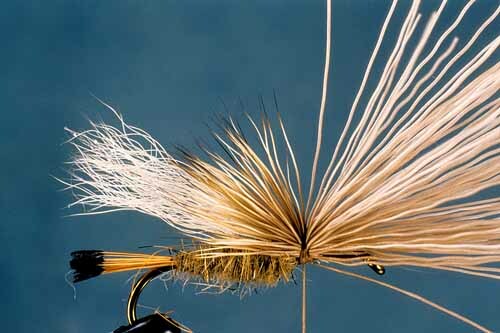 Bind on a section of golden pheasant tippet for a tail; the tail's length should equal the hook's gape. 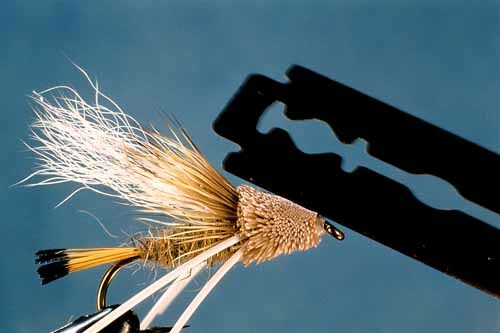 Dub a full, tapered body up about two-thirds of the hook's shank. 2. Cut from the hide, comb, and stack a modest bunch of white calf-tail hair. Bind the hair atop the shank right in front of the body. 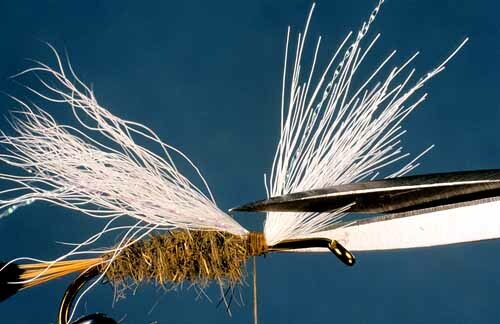 The tips of the wing-hairs should terminate over the tip of the tail. Bind one strand of Krystal Flash on either side of the wing. Trim the butts of the Krystal Flash and the butts of the hair to a short angle, and then bind them. 3. Cut from the hide, comb, and stack a modest bunch of deer hair. Bind the hair atop the calf hair. The tips of the deer should project back as a short top wing, reaching only to about the rear of the body. 4. Loop a short length of rubber strand over the thread and slide it down to the near side of the hook, where the deer is bound. 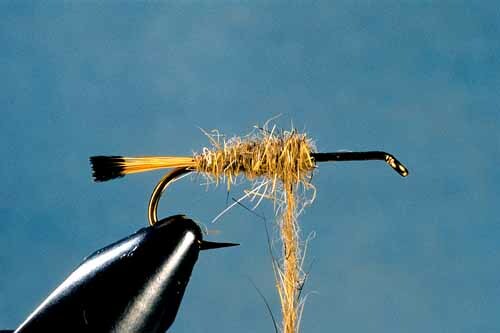 Secure the strand with a few tight thread-turns. Bind another strand on the opposite side in the same manner. Now the half-finished fly should appear to have four long legs. 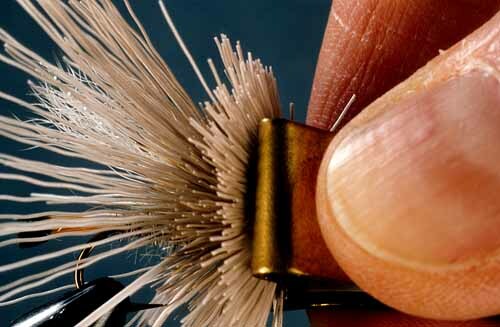 Compress each bunch of hair back into the last with thumb and finger or a hair-compressing tool. Whip finish the thread or make several half hitches. Cut the thread. 6. With scissors, razor blade, or both, shape the head to tapering out from the eye, rounded over the top, fairly flat beneath. Hold the legs out of the way as you trim. Add head cement to the whip finish or half hitches securing the thread. And that completes the Turck Tarantula tying steps. 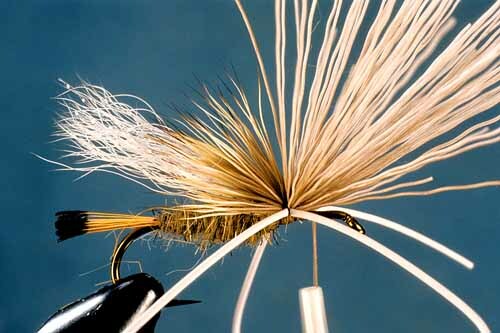 In the previous article,The Turck Tarantula, Part 1, fly fishing author and tying authority Skip Morris discusses the origin and effectiveness of this popular attractor fly.